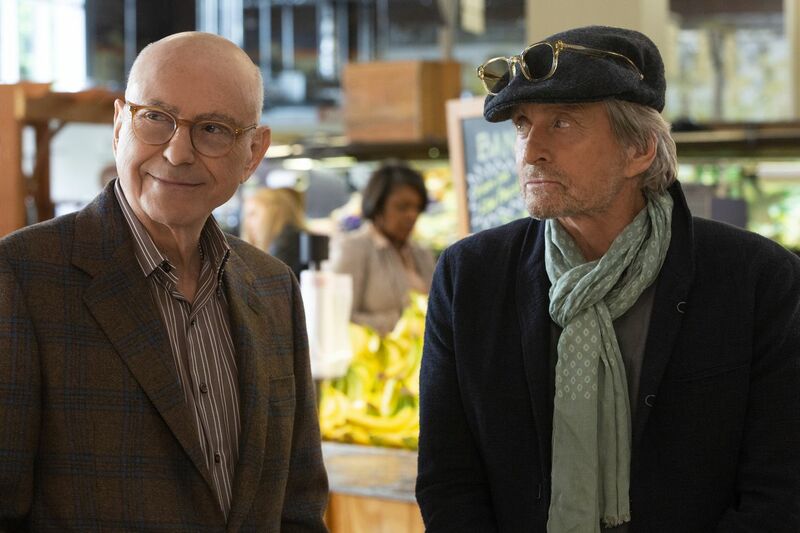 Alan Arkin (left) and Michael Douglas star in Netflix's Chuck Lorre dramedy "The Kominsky Method"
Sally 4Ever. Julia Davis created and stars in this over-the-top comedy about a force of nature named Emma (Davis) who, after seducing the soon-to-be-married Sally (Catherine Shepherd) and leading her to shed her boring fiance (Alex Macqueen), turns out to be more than Sally, or maybe anyone, can handle. 10:30 p.m. Sunday, Nov. 11, HBO. Mars. Second season of the scripted drama/documentary hybrid from Ron Howard and Brian Grazer takes place in the year 2042, when the original Mars colony gets new neighbors, sent by a corporation intent on exploiting the planet for its own purposes. 9 p.m. Monday, Nov. 12, National Geographic Channel. We'll Meet Again. Host Ann Curry begins her second season of trying to bring people together. In the season premiere, "Saved in Vietnam," one veteran looks for the helicopter pilot he believes saved him from death or capture, while another seeks out the doctor who saved his leg from amputation. 9 p.m. Tuesday, Nov. 13, WHYY12. Nova: Thai Cave Rescue. The PBS science series looks at the logistics involved in extricating the young members of a soccer team and their coach from a flooded cave this past summer. 9 p.m. Wednesday, Nov. 14, WHYY12. The Kominsky Method. Michael Douglas and Alan Arkin star in a new Los Angeles-based dramedy from sitcom producer Chuck Lorre (The Big Bang Theory, Two and a Half Men) about a veteran acting coach (Douglas) and his agent (Arkin), both getting older in an industry that's all about youth and beauty. Friday, Nov. 16, Netflix. Jonestown: Terror in the Jungle. Two-night documentary, produced by Leonardo DiCaprio and based on Jeff Guinn's book, The Road to Jonestown: Jim Jones and Peoples Temple, coincides with the 40th anniversary of the mass murder-suicide at the cult's compound in Guyana. 9 p.m. Saturday and Sunday, Nov. 17-18, SundanceTV.